I didn’t know there was a fancy medical name for my dandruff or for the flaky skin on my nose and forehead. It was after more than ten years of itchy-red-yucky-hideous-unomfortable skin problems that I finally heard the words, Seborrheic Dermatitis. Huh? What is seborrheic dermatitis? This sounds serious. Am I dying?! Turns out, seborrheic dermatitis is an inflammatory skin disorder that is usually characterized by redness, flakiness, itchiness and all-around discomfort. It is often greasy scales, though it also seems dry at the same time, which is confusing when you are trying to self-treat. The most common places to suffer from seborrheic dermatitis is the scalp, face and torso or any area that has sebaceous glands. What causes seborrheic dermatitis? It’s probably genetic and can be brought on by stress, hormones, other health problems or environmental triggers. The rash itself is caused by a over-production of sebum, which then turns into an infection . . . which then causes inflammation. There’s a widely-embraed, though unproven, theory that seborrheic dermatitis is an inflammatory response to yeast. More on that in another blog post. Seborrheic dermatitis can really vary in appearance from one person to the next. Some people have yellow flakes, others gray or white. It can happen on your nose, nose folds, cheeks, forehead, chin, behind your ears, eyebrows, eyelashes, arm pitts, genital area, back, stomach, chest . . .it’s not fun, people! Oh, and probably the most common of all: the scalp! If only flakes could be the hottest hair accessory. There are lots of solutions out there to help with seborrheic dermatitis, but no actual cure. So that’s Seborrheic Dermatitis 101. I’ve covered the basics here, but if you are like me, you’re still left with LOTS of questions. Please feel free to ask questions or contribute to the conversation in the comments. *Disclaimer: I am not a doctor or medical expert. I’m just a regular ‘ol twentysomething (ok, thirtysomething) mom who has deat with acne and seborrheic dermatitis for almost twenty years. 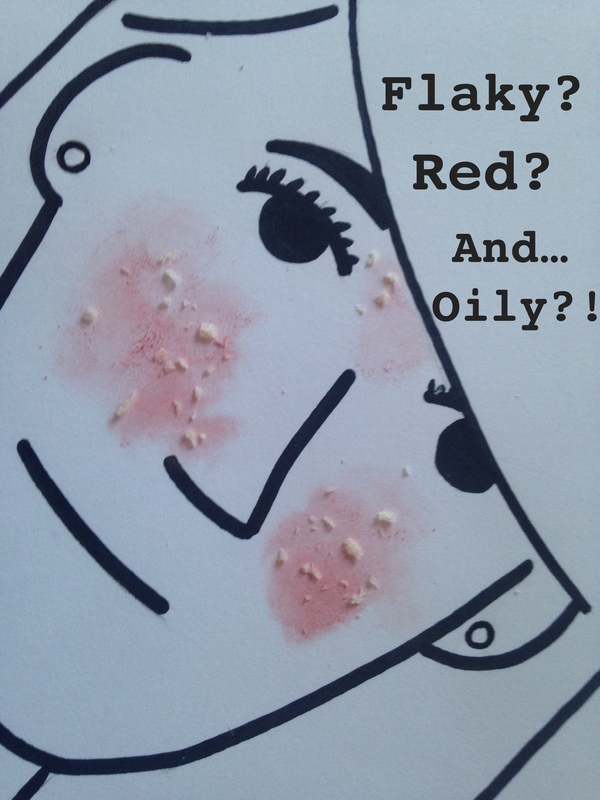 I want to write what I learn and what I experience as a sufferer of skin problems. PLEASE talk to a general practitioner or dermatologist before trying a new skin care regime. hey am also fighting this problem. For the hair, I have not found a steadfast solution.i found selsun purple conditioner helps but silly selsun just changed their formula. then am down to zero again..i use coconut oil once in a while but it doesn’t really help for dandruff. for face I was on steroids for some time. It was the only thing that worked until I started using SKII, then I did not have to use the steroid cream any longer which is good since steroids have really bad side effects in the long term. After using SKII, clear lotion, toner and skin refining treatment (been using for a year plus now and no recurrence), I did not have any more seborrheic on my face.However, its very pricey so I don’t think I can afford to place it on my scalp as well..the price makes me pale. I have dealt with this on my scalp and face for decades. The best natural remedy is apple cider vinegar!!! It got it totally under control for my scalp, after shampooing I would put apple cider vinegar on my scalp and leave it on as long as possible, the problem, every time I would have a hot flash I would instantly smell like vinegar. Then I came across a very hard to find Head & Shoulders shampoo. It is the only one their wide array of choices, a very dark blue bottle, & I mean dark blue. It’s very hard to find because most stores don’t sell it so it’s easier to find online. My face is another story! Whenever I go through a stressful situation even if it appears that I’m dealing with it fine, within a couple of days my face will erupt, forehead, cheeks, nose, chin! The only thing I am finding helpful is water diluted apple cider vinegar applied several times a day with a q-tip. I can get my face almost totally cleared up to where I can wear makeup without it flaking off. It is a constant battle though! I have to use vinegar at least a couple times a day even if it appears that my skin is not broke out with seborrhoeic dermatitis or it will sneak out. But when I stress or comes along I don’t stand a chance and then st ACV doesn’t seem to be working I used that topical prescription for just 10 days and then back to the ACV.